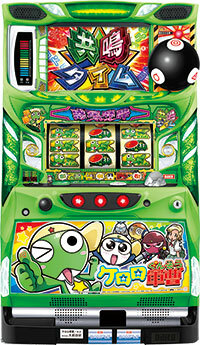 Today, we will be introducing a pachislot machine of “Sergeant Keroro”, a popular manga that has been serialized from 1999 and its anime has been aired worldwide. Its original world is a gag manga depicting interactions between Keroro Platoon that came from Keron Planet to invade and the host family of Keroro Platoon called Hinata family. The pachislot machine is loaded with all 358 stories of the original work. Also, this pachislot machine has a new system called “Sympathy System”. As the members Keroro Platoon sympathizes with each other, the percentage of Earth invasion rises as well!! It has already made its debut to the parlor. Let’s start the invasion at the parlor! !